Home/ How To Guide / How to Build an Indoor Fireplace? An indoor structure built using bricks, stone and metal designed to hold or contain fire in it is known as Fireplace. The main purpose of constructing a fireplace is to keep a house warm and create a relaxing ambience. In this article, we study the construction of indoor fireplace and the necessary code requirements. The first and foremost step in all the construction activities is the creation of a foundation or base. The base must be at least 100mm below the floor level to allow the hearth and extension for a proper hold. The hearth base is 100mm in depth and is supported by masonry foundation. This base must be thick enough and deep enough to support not only the firebox and chimney but also a hearth extension that goes 18 to 20 inches beyond the fireplace opening. Fig 1: Components of Fireplace. The frame of the fireplace is made of metal which is at least two inches away from the outside of the fireplace and/or chimney. The rough opening in the combustible wall should be at least four inches wider than the masonry, and the header should be three inches above the top of the fireplace opening. The inner hearth of the fireplace must be constructed with utmost care as this place is under high temperature and heat. Refractive mortar is used to lay firebricks of inner hearth. If Firebox is used, then the base is made in the above method. If the fireplace is built using just bricks, then all the sides of the inner hearth are constructed using refractive mortar and firebricks. Minimum width of the joints in brick masonry must be 1/16-inch, this can be achieved using spacers. A main component of Fireplace is its firebox. The fireplace opening is placed with steel frame glass door. Build the firebox itself with nine-inch refractory mortar and firebrick laid on edge. Use the glass door frame as a template for the sizing. Lay the firebrick so that they form the front edge of the covings and meet the back inside edge of the door frame. Back the firebrick with masonry that is 75 per cent or more solid, making the firebox walls at least eight inches thick. Next, lay 4x8x16 solid concrete block on the concrete hearth base to create a backup for the firebox. Leave an air space or bond break between the firebox backup masonry and the masonry outer shell. This will ensure that the finished firebox will not crack as it becomes hot and expands. The neck of the firebox and the chimney is known as the throat. It is constructed using refractive masonry and fire bricks. Usually, the depth of the throat is 300mm. These days ready-made metal throats are also available in the market. Same as that of the throat, the pre-casted metal chimney is available in the market. Chimneys must be at least four inches larger than the flue they surround in all directions. Combustible materials must be kept at least two inches away from the outside of the chimney walls to be safe. By code, the chimney top must be 2 feet higher than any part of the roof within 10 feet and 3 feet higher than the highest point of roof penetration. The chimney opening is usually closed with a metal cap so that the rainwater does not enter it. 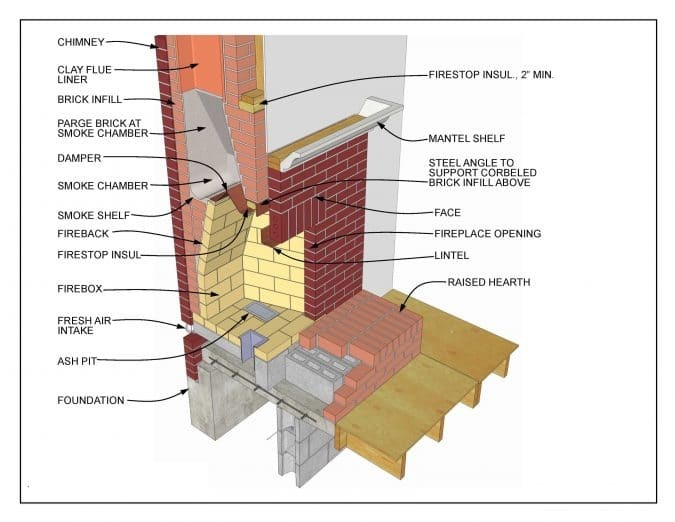 Chimney wall thickness should be a nominal 4 in. (100 mm) unless no flue liner is used, in which case a nominal 8 in. (200 mm) is required. Neither chimney nor flue liner may change size or shape within 6 in. (150 mm) of either floor components, ceiling components or rafters. The minimum chimney height for fire safety is the greater of 3 ft (1.0 m) above the highest point where the chimney penetrates the roofline, or 2 ft (600 mm) higher than any portion of the structure or adjoining structures within 10 ft (3.0 m) of the chimney. Chimney clearance from combustible material is a minimum of 2 in. (50 mm) except where the chimney is located entirely outside the structure, in which case 1 in. (25 mm) is acceptable. The spaces between a chimney and combustible material should be fire stopped using a minimum of 1-in. (25 mm) thick non-combustible material. 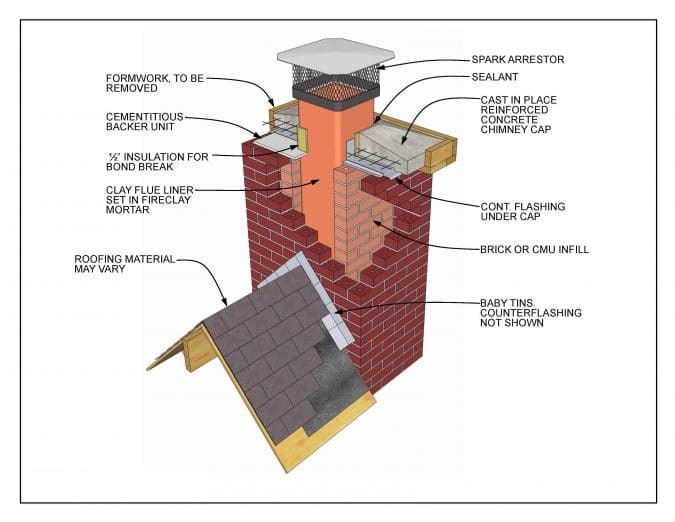 All exterior spaces between the chimney and adjacent components should be sealed. This is most commonly accomplished by flashing and caulking. Masonry chimneys should not be corbeled more than 6 in. (150 mm) from a wall or foundation nor should a chimney be corbeled from a wall or foundation which is less than 12 in. (300 mm) in thickness, unless it projects equally on each side of the wall.